For the SWCKAL I've decided to make "Whirligig-Jeff's Vest" on page 34. Reason? Start smaller with my first time at full Fair Isle patterns. Today we drove up the Kennebec River to Water Street Yarns in Hallowell, Maine. First portent that this was a good trip was an adult American Bald Eagle sitting in a tree as we entered Hallowell. Second was being greeted by a Newfoundland dog as we entered the shop. Third was hubby wandering this tiny town and finding a good place for lunch. 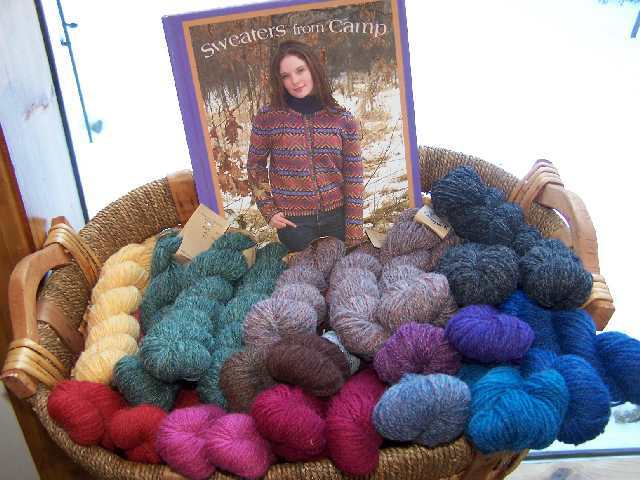 Water Street Yarns, 190 Water St, Hallowell, ME 04347 (207) 622-5500. This is a small, very friendly yarn store where you are greeted by name after only one or two visits. She does not have a web site or email but does sell mail order. Jamieson's Spindrift 25g skeins (old put up) were $4.00 and the new put up 25g balls were $4.45. Selection was limited on quantity of any one color but she had quite a few single skeins in stock. Basket on left (second photo) shows the yarn for the vest. Instead of using #80 Dark Brown, #141 Sage, #30 Lovat and #FC62 Grey Blue I'll be using #598 Mulberry (that really is a dark purple), #155 Bramble, #180 Mist and #175 Twilight. These are all purple/blue colors, mix well but still have contrast. Want to bet I'm swatching tonight? 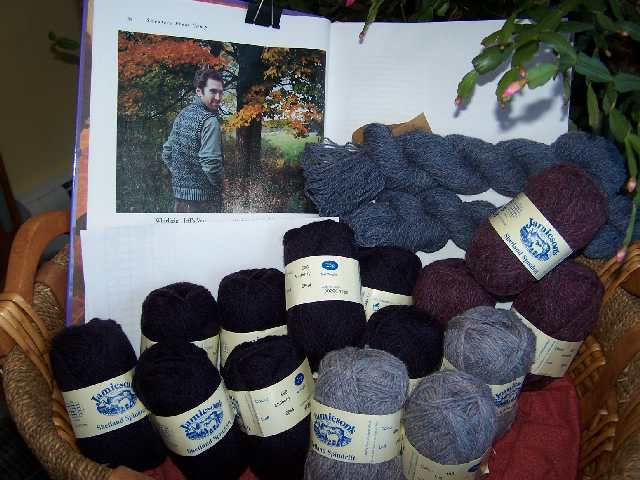 Top photo shows all the single skein colors purchased today; well a couple are triples, not singles, but no one would ever imagine I'm a bit obsessive about yarn! Those are for eventually making the SFC Shirt-Tailed Vertical Paneled Sweater which will take some practice first. I just visited the Harrisville Yarns shop today. It's less than half an hour from me, but it was my first visit, even though I've lived here since late May. My lovely boyfriend purchased 4 skeins of their Shetland style yarn for me - enough for a pair of colorwork socks or mittens.